Russell was born in New Tredegar, Wales in 1888. He began his career with Ton Pentre in 1911 before joining Merthyr Town later that year. 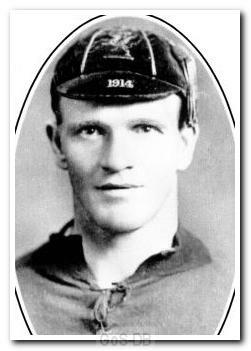 He made his debut for Wales against Scotland in March 1912 and would win two further caps before joining Argyle. In the summer of 1912, Russell signed for Southport Central but the club was suffering from financial problems and he returned to Merthyr in February 1913. Several League clubs had passed on him as his appearance made him look much older than he was, but Robert Jack travelled to his birthplace to obtain a copy of his birth certificate before signing him for a club record fee of £400 in May 1914. Russell later revealed that his baldness was caused by suffering from rheumatic fever as a child. During his first season at Home Park he played at full-back, centre-half and left-half but the outbreak of war put his career on hold. During the conflict he served with the Army Service Corps and played as a guest for Swansea Town. His muscular style and unique look often made him a target for fans at away grounds but he was an incredibly effective defender. Despite being just 5ft 8in tall he was a superb header of the ball, but it was his determined tackling and uncompromising approach that made him the player he was. Russell won 20 further Welsh caps as an Argyle player, all of which came in the Home Championships, which Wales won three times during his time in the side. His haul remained a club record for nearly 80 years until being usurped by Tony Capaldi's 21st cap for Northern Ireland, ironically against Wales, in February 2007. When football resumed after the war he played at right-back, forming an excellent partnership with Septimus Atterbury. When Atterbury retired he switched to left-back, where he spent the next five seasons. The Argyle handbook stated that his "happy association" at full-back with Billy Forbes would "defy comparison with any in the country". Russell went on to become club captain and led the side to the runner-up position in Division Three (South) in six consecutive season from 1921 to 1927. The arrival of Fred Titmuss saw Russell return to the right-back position, and he remained a fixture in the first team until the beginning of the 1929-30 campaign. He played his last game for Argyle in 1930, at the age of 41, having made his final international appearance in November 1928. He also represented Wales on their 1929 tour of Canada. At the end of the 1929-30 season he left Home Park, signing for newly elected Division Three (South) side Thames Association, where he spent two years before retiring after a brief stint with Llanelli. 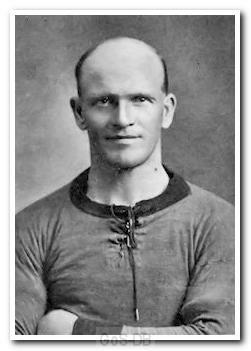 There was no mistaking Moses Russell when Plymouth Argyle took the field in the years immediately after World War One. He was the one with no hair. Rheumatic fever in his youth had deprived Russell of most of his locks. Indirectly that was to Argyle’s benefit because, when he was playing for his first club, Merthyr Town, other clubs doubted whether one who looked so old could make a useful contribution to their cause. Argyle manager Robert Jack had no such reservations and in 1914 he paid £400 - at that time an Argyle club record fee for a full-back - to take Russell to Home Park. However, Jack took the precaution, after watching Russell play for Merthyr, of travelling to Tredegar and obtaining the player’s birth certificate which showed that appearances were deceptive and that Russell was only 22. At that stage Russell had already won three Welsh caps, the first of them as a left-half. With Argyle he was to add 20 to that total, the last of his international appearances coming when he was 40 years old. At Plymouth he established full-back partnerships, first with Sep Atterbury, then with Billy Forbes, which were widely regarded as unequalled in the Third Division. He was a regular member of Argyle’s side throughout that period in the 1920s when promotion to the Second Division proved so elusive. Thus, it was profoundly disappointing to him that he had lost his place to Fred Titmuss by the time the championship was finally won, in 1929-30. Russell was a robust player, good with his head, but he had to develop a thick skin to cope with the remarks of some opposing supporters. They either loved or hated him. His appearance could provoke derision and his style inspired malice. At Luton, in 1920, with Argyle reduced to ten men and clinging to a goal lead, Russell’s tactics were to send the ball into touch at every opportunity. This so incensed one home supporter that he hurled a stone at the full-back. His aim was poor and it was goalkeeper Fred Craig who stopped the missile, sustaining a cut head. On another occasion, whilst touring Canada with the Welsh international team in 1929, Russell’s tackling so outraged one spectator that he drew a gun and threatened the Plymouth man before being overpowered by police. On yet another occasion, he was actually assaulted by a spectator on leaving the pitch. The police, who moved in to arrest the attacker, unfortunately picked the wrong man. He left Argyle in 1930 to join the now-defunct Thames Association. Russell spent a couple of seasons in East London, playing for Thames during their brief spell in the Third Division South. He eventually returned to Plymouth and became manager of a public house in Union Street. He died in 1946. After signing for the club he was due to move into a club house (in Moses' time it was not uncommon for the club to provide accommodation via club-owned houses). His friend and future Argyle player Jack Fowler offered to assist with decorating. After some hours, with paint brushes in hand, they realised they were in the wrong house!